Clear-Vu Lighting’s low voltage LED Lighting Systems are the safe and sustainable choice for construction site lighting. They provide higher levels of illumination and reduce energy costs by 80+%. 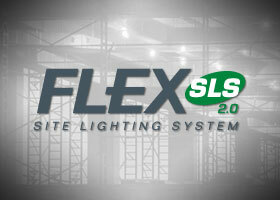 FLEX SLS 2.0 is easy to install and reconfigure. The long-life LEDs and robust construction minimize maintenance costs and encourage reuse – 10-year life cycle. Clear-Vu lighting provides the highest quality lighting systems available with ROIs that can be measured in months – not years! The following product groups ensure safety for the building’s occupants as they perform their tasks and move within the building.